Taking Flight: Friday the 13th! Great-horned Owl and Bald Eagle Hits a School Bus! Friday the 13th! Great-horned Owl and Bald Eagle Hits a School Bus! A Great-horned Owl was rescued by the side of the road by a member of the public. The homeowner was very worried when she first found the bird but did an excellent job of not only getting him off the road and into a box but also transported him the two hours to our clinic. REGI's location is great in terms of being close to where many species of birds nest and live, but our location in northern WI means we are pretty remote to large human populations. We recieve birds from a very large area it is often impossible for staff to physically come and rescue a bird. Handling large raptors should never be taken lightly. However, with guidance/suggestion from REGI staff birds that would otherwise die where they are injured are rescued and brought in for treatment. The new patient Great-horned owl (GHO) has a broken left wing. The photo shows Dan and Alberta getting a weight on the male adult owl shortly after admission. People are always surprised that birds with broken wings can recover and live to fly free once more. Great-horned Owls are nesting now even here in frigid WI. Most have eggs at this time. The loss of the male at the nest site will be devastaing for the family. Males do much of the hunting while the female is incubating the eggs and when the owlets are very young. The female in this case many not have any option but to abandon the eggs and wait for the male to come home to start another family. 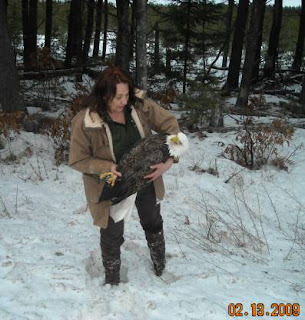 Just as everyone was leaving for the day the Langlade County Sheriff Department called to say a school bus had hit a bald eagle. We jumped in the van and drove @ 35 miles to Post Lake before dark. The eagle was standing about 30 feet into the woods by the road. He gave me a bit of a chase through the deep snow and woods even flying briefly and left both the eagle and myself exhausted. While he did fly he was obviously not feeling terrific. He is a beautiful adult male. It is possible he is the resident male of Post Lake. He has no fractures but does have internal injuries and remains in critical condition. A bus is a serious vehicle to collide with. The eagle was feeding off a carcass on the side of the road. He was apparently was startled by the bus and took to the air. Having filled his crop on meat from the carcass he misjudged his added weight and was not able to gain altitude fast enough to avoid the bus. Fortunately the bus driver and a concerned citizen called in the accident to the Sheriff Department who in turn called us. 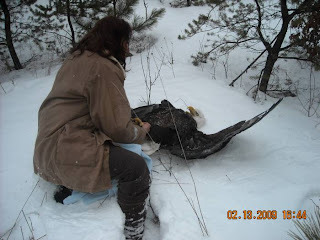 The photos show the bird as I approached it and then coming from the woods to the van. Incredible pictures Marge - thank you for taking the time to post them. I sure hope this bird recovers.